IMPORTANT NOTICE II: This is a BTN sized engagement, and we have the pleasure of having a contingent from United Operations joining us: they will be manning the second COY. Thus there are only manning for one COY. For years there have been tensions between Greece and Turkey, but the tensions have always been suppressed and glossed over by NATO and to a lesser degree by the EU for strategic, political and economic reasons. But that does not mean that the Greeks have ever forgiven The Turkish invasion of Cyprus in 1974, and the two countries have routinely had skirmishes and clashes on and over the Aegean sea. NATO has similarly routinely turned a blind eye to Turkish repression of Kurds and the Armenian Genocide, and EU has done the same in the vain hope that the European popular votes would allow an integration of Turkey into EU. This has never materialized, and in anger and frustration Turkey has increasingly turned to Russia for aid and strength. Despite a few clashes , including shooting down of each others combat aircraft, then these ties have grown stronger and more firm recently. Primarily because both countries benefits from it. 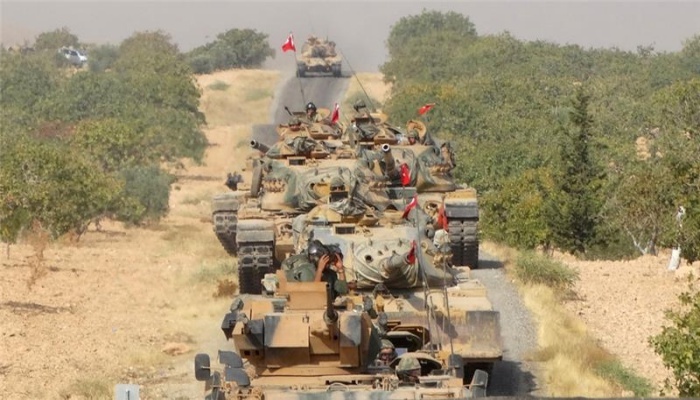 As the Syrian Civil war wound down, the Turkish military increased the pressure and attacks on the Kurdish positions in the north of Syria and South East Turkey with mixed results militarily. These operations combined with the continued crackdown on all dissent internally, has had the political outcome that both NATO and EU found it neccesary to distance themselves from Turkey who became more isolated. This in turn increased the ties with Russia and alienated Turkey even more from Europe. Finally Turkey three months ago took the step of formally leaving NATO and the day after signed a document of peace, cooperation and defence with Russia. In the time since that, then tensions that were previously held back and subdued, have now increased again. Internal dissent while repressed, have in the meantime increased in Turkey. In a move that somewhat brings memories of the Argentine invasion of the Falkland Islands, Turkey decided to invade one of the islands that have been disputed for years. In part to assert their dominance of the eastern Aegean, and in part probably to create internal cohesion against a common enemy. It is rumored that the Russian have been promised by Turkey, the rights to build a naval- and airbase on the island in exchange for continued material and political support. The invasion was largely unopposed and the Turkish forces quickly seized the Island with the use of heavy bombardements from the air and sea. In an unforseen and tragic event, a strike mission hit the wrong target and struck a holiday resort where 6 Swedish and Italian high school classes were on a vacation and study tour, with numerous casualties and wounded. Sweden and Italy are enraged and demanded immediate access to provide aid and help to their citizens, which in the general turmoil was denied. It was thus unknown how many of the Swedish and Italian youths are still alive and in what condition they are in. Russia supported by China have used their Veto´s to block all attempts of condemning Turkey, let alone create a UN led intervention. Turkey have declared that they provided all the care they could for the wounded and have since released the bodies of the deceased and many wounded. But as Turkey still refuse any international observers on the Island, it is unknow if all Swedish and Italian citizens have been released. Greece have in the meanwhile invoked Article 5 of the NATO charter, but NATO has been reluctant to directly declare war on Turkey for a number of reasons. And Sweden - not being a member of NATO - have thus seeked other bilateral solutions in cooperation with Italy who is a member of NATO. 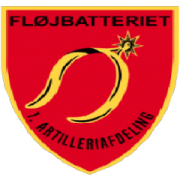 This have now coalesced into a Peace Creating force, which are going to strike the Island in the next hours, led by American forces and with small Italian and Swedish contingents. USA along with the rest of NATO have declared an exclusion zone around the area in an effort to contain the conflict and deny Turkey more reinforcements. 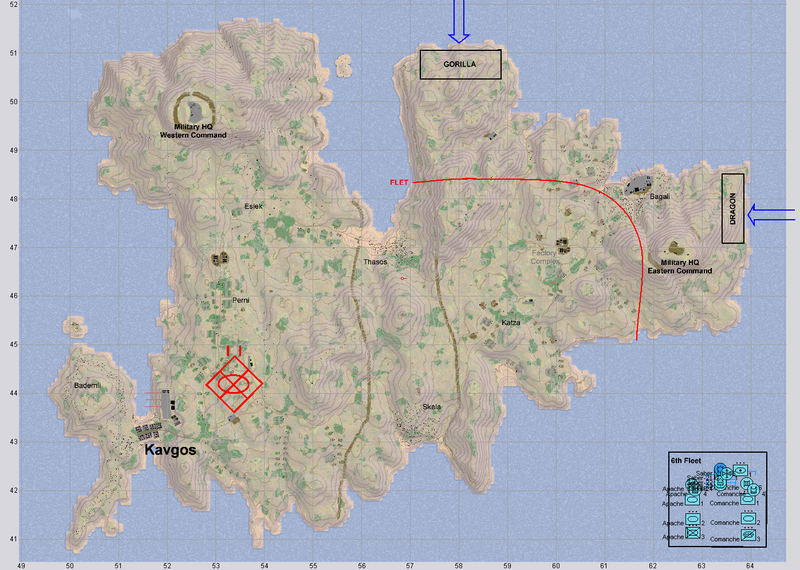 The Turkish have erected two barriers across the islands, but these are more for controlling the area and anti-COIN, than any real obstacle, and should be passable with care by all the TF´s Callsigns. 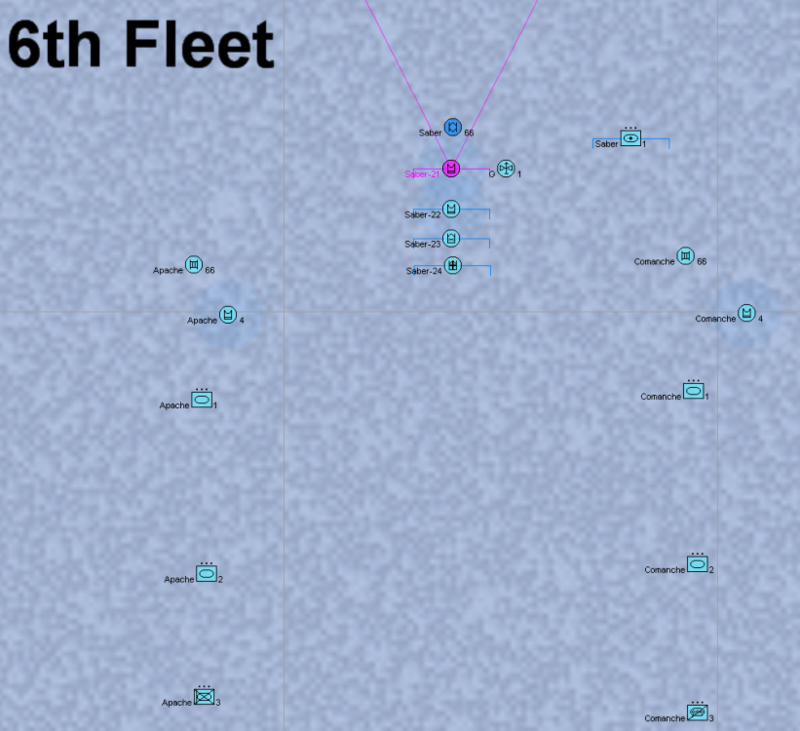 In preparation of the landings American, Italian and Swedish planes, including from the US 6th Fleet, have struck the areas around LZ Dragon and LZ Gorilla, which means that there is a high confidence that the initial landing operation will be unopposed. At any rate then the Coalition forces hold Air Control and thus dominate the Airspace around the Island. The air units have destroyed a number of Turkish units, estimated at TNK COY size, the hulks of which now litter the areas between the Landing Zones and the FLET as indicated per map trace, where SIGINT estimates that the ENY have withdrawn to. We still expect the Turks to have around BTN sized assets remaining in the AO including TNK, ATGM and IFV, as well as a limited number of SP ARTY. Expect heavy resistance, the Turkish soldiers are veterans and have their backs against the sea. Task Force Saber will attack to seize the capitol city of Kavgos to restore national integrity and stability. The purpose of this operation is to defeat the Turkish invaders and restore territorial integrity to the island. Battalion has been given direct support from 1x reconnaissance and observation helicopter. @Grenny do you want to PC? I'm up for gunning for you again! Put me in apache 1 pls. A M1A2 slot please. Thank you. American, by the way. 3.A3 has 4xTC before gunner slots at the tankies get filled. plan is done as soon as we have two COy COs ready to brief. And you have them - will PM you all in a few minutes ! So we have a brand new potential player: Angrymuffins would like to join us Sunday. From what I understand then its a brand new thing, so a soft start would be welcome: ie. somebodys gunner. Ad. 3 I still agree, but Angrymuffins have never played with us or in any MP context before from what I understand, let alone in MECHINF. So for a smooth and troublefree start then MECHINF is probably not a good fit for the first time. I can give the new guy my track and take the mech inf position if need be.